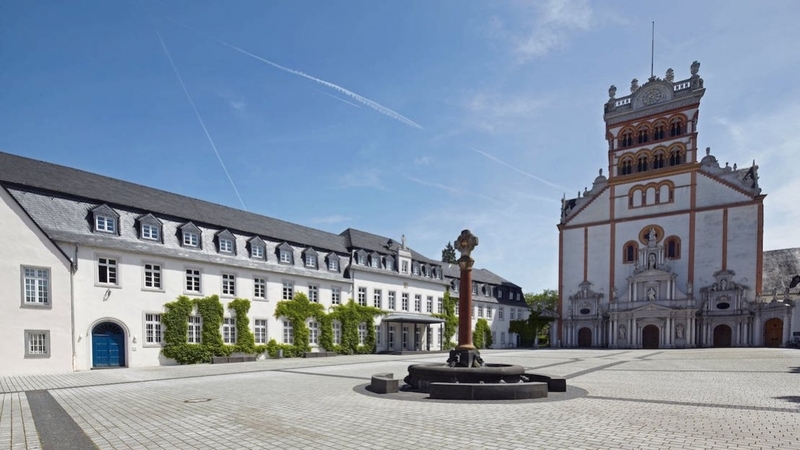 Intruders entered the Benedictine abbey of St. Matthias through a window during the night of December 18th and ransacked several rooms and the adjacent church, breaking sacred objects, overturning furniture, and setting fire to songbooks and other papers. Police estimated the damage to be in the thousands of euros. When Brother Athanasius opened the church of St. Matthias around 5 o'clock in the early morning of December 19th, he discovere devastation: all the candles in the sanctuary, the Easter candle, the tomb of Saint Matthias, and the sacristy had all been torn from their holders and broken on the floor. The large glass vase with the white roses in honor of the patron saint was broken next to the large sandstone figure. The heavy oak lectern is overturned. Almost everything that could be knocked over was thrown to the ground. The smell of smoke rises from one of the six Nordmann fir trees that were to be set up and decorated in the church that day: the needles were covered with wax, and charred remains of a songbook was found between the burnt branches. It appeared that the intruders had attempted to set the tree on fire, but failed because the Christmas tree was freshly cut and still wet from the rain. Two stacks of prayer books, several benches, and the bulletin boards where the parish announces its appointments were also burnt. "We were very fortunate that no great fire broke out," said Brother Matthias. The discovery of the damage "was a shock." The glass door to the refectory was smashed with a 6 kilo paving stone. The only thing stolen appeared to be the kitchen team's petty cash box. "Perhaps because of anger [because nothing of great value could be found] they destroyed the candles and set fires," said Brother Matthias. Police spokesman Karl-Peter Jochem agreed. "Since only the piggy bank - probably more of a coincidence - was stolen, it could be that the perpetrators deliberately entered to cause property damage - then it would not be burglary, but pure vandalism."